The 86th Academy Awards honoured films released in 2013. Of course an Oscar year is an arbitrary time frame, used to crown achievements in film. But the lists of nominees and winners throughout the years is useful. It is one form of reference by which to discover films, to watch and re-watch. 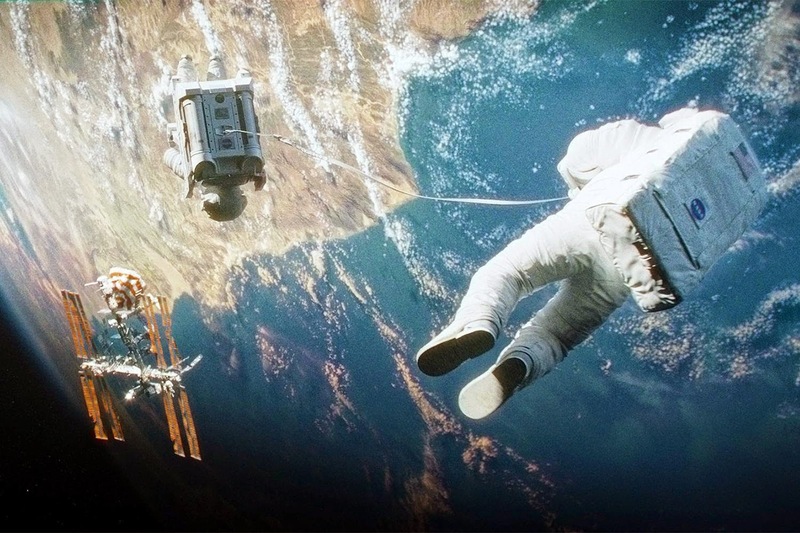 I have no problem suspending disbelief for the events in the film, such as Dr. Ryan Stone (Sandra Bullock) leaping from space station to space station, or her miraculous safe landing on earth. To be honest I did not give any of it a second thought. What is inadequate, in terms of believability, is the characters of Dr. Stone and her colleague Lieutenant Matt Kowalski (George Clooney). Dr. Stone is mentally and emotionally unprepared for their mission. Anyone in such a fractured state as Stone (still mourning the death of her daughter) would never be put on a mission into space, which requires the utmost objectivity, mental precision, and focus. At one point, while Stone is floating above the earth, Kowalski asks her where her home is (he also finds out about her daughter's death.) This is beyond ludicrous. Stone and Kowalski's training for their mission would have been long, laborous, and intimate. It is inevitable that such basic information would have come up prior to their launch. Moreover, someone as disciplined as an astronaut would never bring up the (still fresh) subject of their child's death on a mission, especially when it is going to distract/upset them. I could go on. I am not being hypercritical in the least, as clearly this is all common sense, whether the observer has knowledge of space procedures or not. Clooney's character Matt Kowalski has no personality. The dialogue between Kowalski and Stone is vapid, asinine, and farcical. The weakness of the acting (and the characters), can be articulated in a single sentiment: any actors could have replaced George Clooney and Sandra Bullock, and the film would have achieved the same emotional result. The entire blame for the performances, of course, does not lie on the actors, nor Cuaron. Clooney and Bullock were working with a terrible script. But they must take some responsibility, since they took on the roles. Whether Cuaron wrote the script or not, he is responsible for overseeing it. (Cuaron did co-write the script, with his son. But, considering its shortcomings, I do not understand why Cuaron contributed to the screenplay. He cannot write well.) Cuaron is very talented at constructing intricate, interesting camera setups. But the film's total reliance on visuals, combined with the fact that the entire thing is stitched together by a suffocating soundtrack, is Cuaron's compensation for the emptiness of the writing. I am sure the film's visuals will stand the test of time, into the foreseeable future. The CGI, lighting, and sound editing, in particular, stood out. The CGI is pretty flawless. And the stupendous lighting is so convincing, so sophisticated, that after two viewings I have barely absorbed it. In the final scene, after an emergency landing on an ocean shore, Sandra Bullock climbing out of the water looks like Sandra Bullock climbing out of the water. And even though she has just gone through the most mentally, emotionally, and physically tolling ordeal of her life, her skin doesn't have a blemish. Her glowing face makes it look like she's on an advertisement for a facial cleanser. And even looking past this, the penultimate scene of Stone stepping back onto land should have been the most powerful image of the entire film. But in fact, this was the most underwhelming visual, by far, in the movie. The soundtrack could be beautiful on its own, but in the film it is, again, absolutely suffocating. And it takes the attention off the visuals, which probably should be the focus. Surely Cuaron was trying to make the film as dramatic as possible; but maybe it shouldn't have been dramatic. Why did Cuaron have to turn his space film into some Hollywood thriller? Because the visuals are so fantastic, why couldn't Cuaron have directed his efforts into another project to better serve the public; collaborating on scientific, educational space documentaries? Maybe his ego got in the way. Maybe his wallet got in the way. Maybe it's arrogance. Or maybe Cuaron is simply more interested in the dramatic than the scientific. If that is the case, fine. He made a dramatic space thriller. And it was largely a failure. If he refuses to acknowledge this, he is deluding himself. This film isn't going to be as shocking to a viewer now as it will be to a viewer in a hundred years. Because the funny thing about "Her", the great thing about "Her", is that the present audience is desensitized to the insanity the film portrays. A perfect example of this: in the film's world (a tad more technologically advanced than our own) everyone walks alone, plugged in. It is the same as our society now; everyone engaged in their many devices, rarely with each other. This is actually something very disturbing and unhealthy. But to most it is just a normal, ubiquitous occurrence. A premise that easily could have been directed into lame territory is handled with astuteness and depth. Director Spike Jonze has a firm understanding of the subject. There literally is a method to his madness. And after watching this, I discovered that the film stars four huge actors. I just didn't recognize them in the film. You know the acting is good when. During the first few minutes is an infuriatingly common editing choice: showing scenes that we reach later in the film. Putting these as the first scenes in the film, they are entirely out of context, and fail to elicit emotion. Playing in the background of these opening shots, the (otherwise magnificent) soundtrack sounds hammy and forced; and the accompanying visuals look artificial and constructed. Later in the film, when these exact same shots appear a second time, within the proper context, they are captivating. By the time the credits rolled I was a statue. Overcome, hand pressing chest, I was near tears. I mean yes, during the first few minutes I thought my eyes might become lodged in the back of my head because I couldn't stop rolling them. The film got off to a weak start. But the further it ran the better it got. The performances were devastating, in the best way possible. Only two complaints about the picture come to mind. One, the terrible makeup and costumes. Even though this was a movie rather than a film... the costumes and makeup were still too movie-ish; not natural enough, not realistic enough. At more than one point I was aware that the actors were walking around in costumes. My second qualm is the title card stating that the film is based on a true story. The phrase is a dumb fad, and I am so sick of seeing this imbecilic claim in, like, every second film made now. The fact is that every movie is inspired by life. Yes, the story in "12 Years" does come from the memoir Twelve Years A Slave (1853) by the real Solomon Northup. But not only is the "based on" annotate redundant; it is inaccurate. McQueen can call his character Solomon... but on the plantations the real Solomon Northup was on, the people probably didn't have a constant orchestra concerto playing in the background, and they probably didn't speak in such perfectly succinct, articulate sentences. And in his memoir, Solomon doesn't mention having his life saved by Brad Pitt. "12 Years A Slave" is not a masterpiece, but it is a great film. With slavery being abolished, hopefully the film will not only inspire critical thought, but critical action against current persecutions; the most pressing being the barbaric attitudes toward homosexuality.